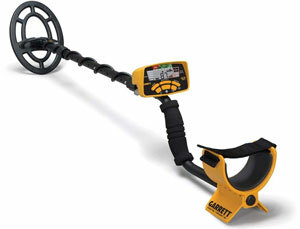 Are you planning to try metal detecting but don’t want to spend a fortune on a top-end detector? 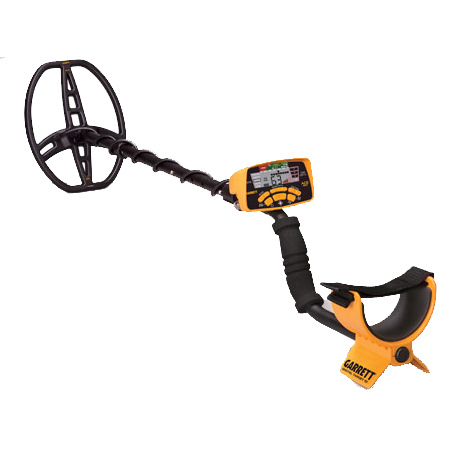 If so, these five beginner metal detectors provide a high-quality detecting experience for a fraction of the cost. 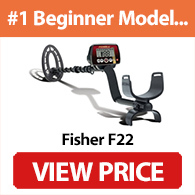 My top pick for a beginner's metal detector is the outstanding Fisher F22. It's a lightweight detector that's easy to use but with plenty of features, including fast reactivity and numerical target ID. For serious metal detecting without spending a fortune, this is my favorite option. Walk through most outdoor-related department stores and you’ll find plenty of “metal detectors” aimed at beginners or children. These models are cheap and readily available - so why look anywhere else? The problem is that these detectors are effectively just toys. You’ll be lucky to get any signal unless the object is on the surface. And even when you hit a target, it’s likely to be junk such as a pull tab. Fortunately, there are some excellent models that provide professional-standard performance for a much lower cost than premium models. While beginner detectors often lack advanced features and settings, the best options still provide features such as visual target ID, depth indicators and notch discrimination. Most importantly, they can detect coins, jewelry and relics at a reasonable depth (up 6”-8” depending on the ground conditions). To help you get started in this addictive hobby, I've put together a list of my five top picks for beginners. Before I go any further though, what should you look for in a beginner metal detector? Are These Detectors Suitable for Kids? It’s important to understand there's no "best" detector for all situations. Instead, you need to choose a detector that matches your experience, budget, local area and desired targets. Here's a quick guide to choosing your first machine. There are two key factors to consider when choosing a metal detector: where you’re going to hunt and what type of target you’re hunting. Let’s start with the second question: what do you want to find? The models in this article - and all cheap detectors - are designed for all-purpose hunting. They are perfect for hunting jewelry, coins and relics in parks, dry sand or fields. For most beginners, this is all you need. What they can’t do is hunt for gold nuggets and flakes. Beginner detectors will pick out a gold bracelet at a park, but they don’t have the features required for gold prospecting. For that, you’ll need to spend more money on a model such as the Garrett AT Gold or Fisher Gold Bug 2. And even those machines can’t match the gold hunting performance of expensive gold detectors such as the Minelab GPZ 7000. If you’re interested in gold detecting, you can click here for my full guide to this type of detector. But as long as you’re not planning to hunt for gold, you don’t need to splash out on a gold detector. Instead, one of the beginner models is a better choice. Beginner detectors can handle dry sand, but struggle with excessive chatter on wet sand. Now what about the second question: where are you going to hunt? The level of ground mineralization varies depending on where you live. The higher the mineralization, the more “falsing” and “chatter” you’ll get from a detector. You’ll need to lower the sensitivity of the machine to counteract this, which reduces depth. Premium detectors have both automatic and manual ground balance adjustment, which allows them to “ignore” mineralization while maintaining decent depth. But the average entry-level model is likely to struggle with high mineralization, as they often only have pre-set ground balance. This is calibrated to the average ground conditions, not for highly mineralized soil, and can't be adjusted. So, if you happen to live in regions with high iron concentration, or if you’re going to be hunting on wet sand (which causes similar issues), be prepared to spend more on a detector designed to handle these ground conditions. The good news is that the detectors below can handle the low or medium-levels of mineralization found in most soil. Another consideration is whether you want to hunt underwater. Nearly all detectors have waterproof coils, but the control box is often not waterproof. This means you can use the detector in shallow freshwater locations, such as the edge of creeks or rivers, as long as the control box stays dry. I don’t usually recommend this though. All it takes is one slip and your detector will be ruined. So, if you’re planning on hunting in water, look for a submersible detector. Note: If you're not sure where to hunt, check out my guide to the best places to use a metal detector. The world of metal detecting can be a confusing place for beginners. With endless terminology, not to mention a huge range of models and features, it can be hard to know where to start. Operating Frequency. This is simply the speed at which the machine oscillates to create a magnetic field. People often think that a higher frequency is “better,” but this isn’t always true. While higher frequencies are more sensitive to small items, lower frequencies provide greater depth. Most beginner detectors have a frequency in the range of 5-10kHz which is perfectly adequate for general-purpose hunting. Weight. The weight of a detector is a vital factor - yet it’s often overlooked by beginners. The lighter a detector, the longer you can swing it without getting fatigued. Discrimination and Notch Discrimination. There’s nothing more frustrating than digging up your tenth pull-tab or bottle cap without a single real find! For this reason, professional detectors can discriminate or ignore targets depending on the type of metal. This is achieved by setting a threshold conductivity and ignoring anything below this level. Detectors with notch discrimination allow you to “notch out” conductivity levels, rather than remove everything below a certain threshold. Depth Indicator. Many modern detectors have a basic coin depth indicator. This provides a quick estimate of how deep your plug needs to be, although the accuracy can vary greatly. Ground Balance. As I mentioned earlier, ground balance can reduce chatter and increase detection depth in mineralized locations. Most beginner detectors come with “pre-set” ground balance, which is based on average ground conditions. This is fine for low or medium mineralization, but not for “hot” ground. More advanced detectors come with automatic ground balance, which allows the detector to adjust according to the current conditions. If you’re going to be hunting in areas with high levels of mineralization or in wet sand, you’ll need either manual or automatic ground balance. Target Identification. Target ID provides a gauge as to how your detector responds to different types of target, so you can predict an item before you dig. The most basic metal detectors show a “signal strength” which is a crude measure of the size and conductivity of an object. Others (such as the Garrett ACE 250) show categories of target ID, which gives a rough idea of metal type. More advanced detectors have numerical target ID, which is a number between 0-99 depending on the target conductivity. This provides more precise identification. Search Coil. The stock search coil of a detector should be suitable for basic detecting. As you get more advanced, there are often additional search coils available with a variety of sizes and technology. Big coils are great for depth and covering large areas of ground, but smaller coils provide better target separation and greater manoeuvrability. If you want to learn more, check out my page on how metal detectors work. I’ve also written a more in-depth buyer’s guide on the homepage. It’s a common misconception that only expensive metal detectors can hunt gold, silver or other types of valuable metal. This isn’t true. All “real” metal detectors can find any metallic object, including silver, tin, aluminum, lead, bronze and nickel. With that said, a beginner detector is aimed at people who want to hunt coins, relics and jewelry. These items are often found at depths up to 6”-8” in parks, woodland, fields and dry sand. While beginner detectors can find gold, they aren’t suitable for the tough ground conditions where nuggets are often found. The operating frequency of a detector can also affect what it's likely to find. Lower frequencies provide greater depth but at the cost of sensitivity to small objects. This is useful for hunting relics, but can be a hindrance when trying to find jewelry. Higher operating frequencies provide greater sensitivity to small objects but less ground penetration. This all sounds very technical, so I want to take a step back before getting to my recommendations. While I’ve talked about a wide range of features, settings and other considerations, you don’t need to fully understand everything about metal detecting before you get your first detector. In fact, the best way to learn is to get out into the field and start finding hidden treasure. Just keep the features and considerations I've mentioned in mind when you're searching for a detector. 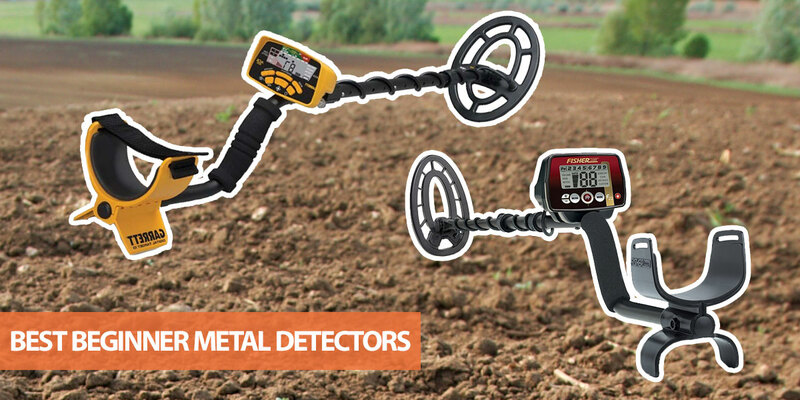 The detectors below are aimed at beginners who want to take a serious interest in the hobby of metal detecting. They are probably overkill if you just want to hunt a few times a year - a toy detector is probably all you need - but for proper detecting they are great options. The Fisher F22 is my top recommendation for a cheap metal detector. It provides many of the features you would expect from a more expensive machine - yet is available for a fraction of the cost. To start with, the F22 weighs in at a lightweight 2.3lbs. For comparison, some of the heaviest detectors (such as the Minelab CTX 3030) weigh more than double - which isn’t great for your arm or shoulder. It’s also well-balanced, durable and has a waterproof coil. If you’re serious about metal detecting, you’ll be grateful for this lightweight design after a few hours in the field. Trust me on that one! Away from the design, Fisher has included “Iron Audio” with the F22. This is an advanced feature that allows you to adjust the volume of ferrous targets in comparison to desirable targets. You can then decide not to dig the target if it’s likely to be a bottle cap or other unwanted item. While this might not sound like a big deal, anything that helps avoid junk is a welcome feature, as it’ll save time and frustration. Aside from Iron Audio, Fisher has managed to pack a huge amount into the F22 while keeping the price low. Other features include the clear read-out, 10 sensitivity levels, pre-set notch discrimination patterns, full numerical target ID and depth indicator. There’s even a five-year warranty. In other words, if you want a beginner metal detector that provides great performance, a range of advanced features and plenty of scope for improvement in your skills, the Fisher F22 is an easy choice. I believe it's the best metal detector for the money. 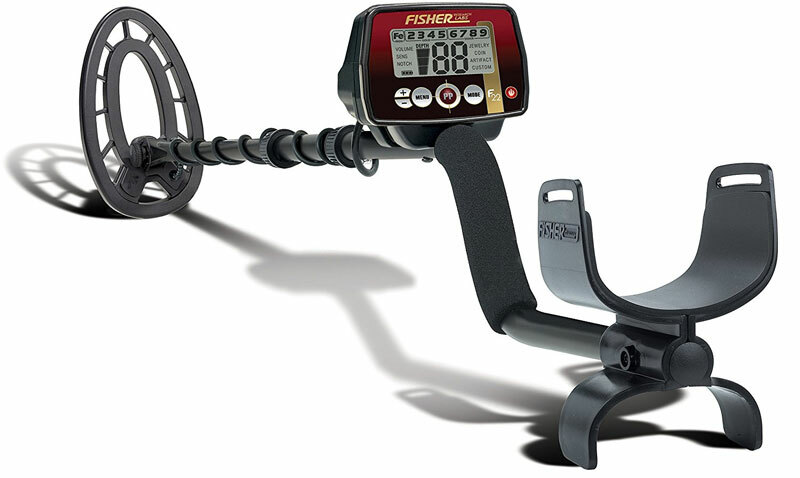 Note: If you want to learn more about Fisher metal detectors, click here. 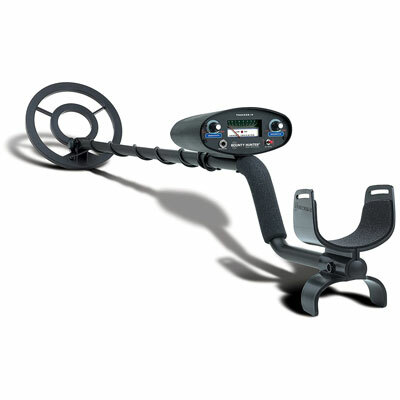 Minelab are usually known for their premium metal detectors costing thousands of dollars. But many people don't realise the company also produces an entry-level model: the Ex-TERRA 305. The 305 is a VLF detector aimed at beginners or those on a budget. While it can't match Minelab's more expensive models, it benefits from much of the same technology and is an excellent choice as a first detector. Why would you choose this over the F22 or any of the other models on this list though? The 305 comes with a range of interesting features, including Minelab's VFLEX technology. This allows you to switch between 7kHz and 18.75kHz operating frequency by changing the coil, making it a versatile machine (you'll need to purchase the extra coils separately though). As you would expect from a Minelab detector, the 305 is accurate and does a decent job at iron discrimination. It also has manual ground balance adjustment. This is rare for beginner detectors, so the X-TERRA 305 could be a great choice if you live in areas with high mineralization. Other features include 2 pre-set search patterns, an all-metal mode, three tone IDs, threshold adjustment and a noise cancelling function. There are some downsides though. The stock coil isn't the best we've seen, so you'll probably want to upgrade it relatively quickly. It's also a bit pricier than the cheapest beginner metal detectors. Even so, if you want a machine with more advanced features than the average "first detector," it's a model to consider. The Garrett ACE series has always been a popular option for beginners - and for good reason. These models are easy to use and provide great value. Which is the best ACE model though? If you’re a beginner, I think the ACE 300 provides the best balance of performance and price. It comes with a range of features you would expect from a more expensive detector, such as adjustable notch discrimination, coin depth indicator and numerical target ID. For comparison, the ACE 250 doesn’t include numerical target ID, while the ACE 200 doesn’t have adjustable notch discrimination. There are also four pre-set modes for hunting coins, relics and jewelry, along with four iron segments and a pinpointing mode. There’s no “Iron Audio” - you’ll need the ACE 400 for that (see below) - but it’s a great all-rounder for jewelry, dry beach hunting and coin shooting. A bonus is the frequency adjustment option. This is handy when you’re getting electromagnetic interference from a nearby power line, as a small adjustment in frequency can reduce chatter. While I prefer the Fisher F22, the Garrett ACE 300 is an excellent choice for beginners. It’s arguably easier to use than the Fisher, yet provides many of the same features for an affordable price. Bounty Hunter doesn’t have the best reputation in the metal detecting world, as some of their models are more toys than true detectors. There are exceptions though - and if you’re on a tight budget the Bounty Hunter Tracker IV could be a great option. The biggest advantage of the Tracker IV is the price. With an MRSP of just $130, it’s at least half as cheap as the other models on this list. It's also often on sale for even less. What do you get for your money though? The Tracker IV is a simple model with an analog read-out for signal strength. There are dials to adjust sensitivity and discrimination, along with a two-tone audio mode that’s useful for getting more information about the target. As you would expect, the Bounty Hunter lacks many of the features found on the other models on this list. There’s no notch discrimination, iron audio or target ID. It also doesn't come with a pinpointing mode. With that said, it provides surprisingly good depth and sensitivity for such a cheap machine. It’s certainly a step above the toy detectors you see in Walmart or kid’s stores. Don’t expect the same performance as the Garrett’s or Fisher’s on this list. But when it comes to inexpensive detecting for under $150, the Tracker IV is probably the best choice. I mentioned the ACE 300 provided the best balance between value and performance for a starter detector (at least in the ACE series). What if you have a bit more to spend though? In that case, the ACE 400 is one to consider. It has all the features of the ACE 300 but has a higher 10kHz operating frequency and larger 8.5” x 11” DD coil. This coil provides better target separation and small object sensitivity. Another advantage of the ACE 400 is that it includes Iron Audio. This alters the audio signal depending on the ferrous properties of the target. It’s the only model in the ACE series to have this feature, so it’s great for picking out trash items before you dig. In terms of performance, the ACE 300 and ACE 400 have similar detection abilities. I recommend choosing the ACE 300 unless you’re certain you need the Iron Audio feature though, as you can always upgrade the coil later. The detectors on this list are often suitable for kids, as they are relatively simple to use and cheap. You also need to consider factors such as the child's age, strength and detecting experience though. These considerations are often more important than the detector's features and settings. That's why I've put together a separate list of the best kids metal detectors. I recommend reading that page if you're looking for a children's detector - although there is some overlap in models. If you’re looking for a beginner metal detector for all-purpose hunting, it’s hard to go wrong with any of the detectors on this list. They all provide excellent detection capabilities for a cheap price. The only exception is the Bounty Hunter Tracker IV. It’s considerably cheaper than the other models, so it’s a great choice if you’re on a tight budget, but it’s missing many features found on the other four detectors. I hope this article helps you get started as a metal detectorist. Be warned though - it’s an addictive hobby! 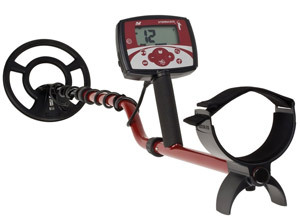 Do you have any questions about choosing the best beginner metal detector? Or do you have any feedback about this page? Let me know in the comments section.